For all those mornings when you’re staring into your cup of coffee and sighing over the fact that it’s not, in fact, piping hot soup, well, okay, you’re odd. But also you’re in luck: Campbell’s Soup says it’s going to start offering K-cup soup packs for the Keurig single-serve coffee machines. This brings up the question of noodles for breakfast — and I think I’m onboard with that. Where are the noodles going to come out of? Can you use the same machine for soup and coffee or will your coffee come out tasting like alphabet soup? Apparently the K-cup pack of broth brews over a packet of dry pasta and veggies. And your coffee won’t taste like soup because Green Mountain says its machines cleanse themselves during the brewing process. Very intriguing. “It’s delicious soup at the touch of a button,” Campbell CEO Denise Morrison said in a phone interview, via the Associated Press. 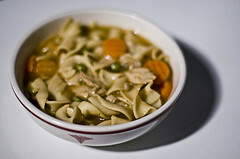 Three varieties are set to launch next year, including Chicken Broth & Noodle. Everyone’s favorite pick-me-up!